It’s time for my blog to change, grow and become something that I hope will be better than ever. I missed my first blogiversary (remind me next January 5th) but now I’m looking at what amazing things I can add in year two. The main focus for my blog has been and will be my running. But hearing about the miles I run, or the races I tell myself I’m going to do can become repetitive. So I’ve come up with a few ideas on ways to expand my blog…. Obviously nothing is set in stone, but I do want to see what else my blog has to offer. After seeing cute photo’s that Kimi has posted, I decided I had to get in on this fun. 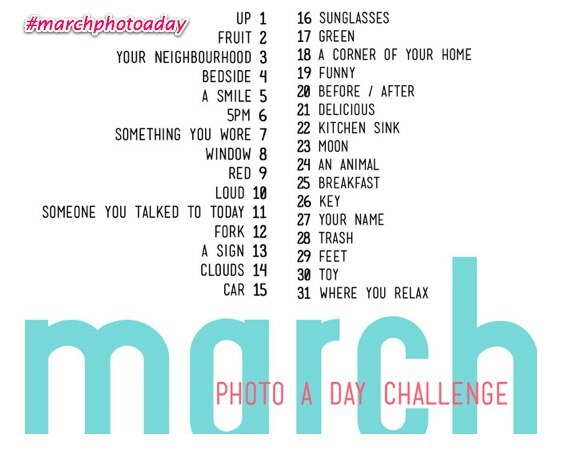 So I did a little research and found the photo a day challenge for instagram. I’m excited to try it out for the month of March. I won’t post every photo on here, but you can see them on Twitter. If you’re interested in doing it too, here’s what you’ll need to do. So now that I have some ideas on making this a better blog, what do you think? What should I add to my blog?? I’m still trying to figure out my blogger voice and identity even though I’ve been at this for almost two years now. It’s a fine balance between doing what you want to do and also respecting your readers, but also realizing not everyone will like every change. I think announcing changes is a good start! Good luck! Great way to start again. I am very new to the blogsphere… is that really a word?… and am drifting through the A-Z challenge list and landed on your site. So glad that I did. I like how you think. Pop over to my site and if you think I’m off to a fair start or not. I always appreciate advise from someone who really knows how all of this works. Tks and have a great day!